Sequoia candy bars come in several flavors. The one pictured above is strawberry chocolate. They are considered to be in the dagashi (cheap sweets) category of candy. These candy bars are usually sold individually and are priced around thirty-five yen apiece. 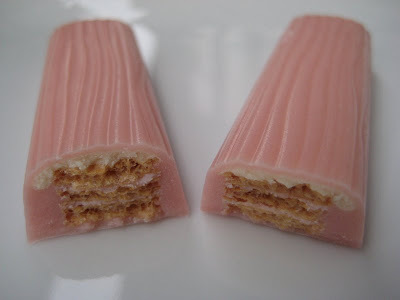 This strawberry version has a strawberry cream, milk cream and wafer center. One interesting note about these famous candy bars is that they are popular with students taking entrance examinations. 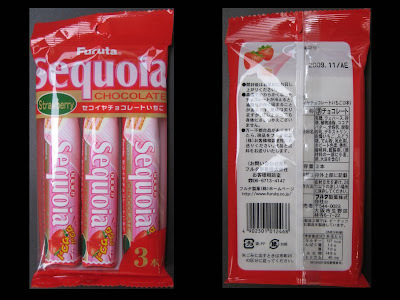 The reason being is that the Japanese pronunciation of these candy bars is sekoiya. This resembles the word seikou, which means success. By eating these candy bars I guess the students hope to pass their test. Personally, by eating these candy bars I haven’t had too much success on my diet recently. Purchasing memory cards is such a time consuming process... You have to search online for prices, sort through which ones are genuine, go out to a bunch of stores,compare prices, finally buy your memory, and then hope that the price doesn't fall in the next two weeks or so. I've been done in by rapid price drops in the past... especially this one time when I bought a Micro SD card for my DS flashcard at what was apparently a bargain price, only to later see that it fell $5 in a week.